The rototoms were invented for Remo drum skin and drum practice pad brand in the late 1970s by Al Payson at the request of percussionist composer Michael Colgrass who was seeking for precise tuned drums. They are equipped with an ingenious tension screw. There is only one single drum skin, which gives a characteristic clear sound, with its fundamental tone quite accurately. The frame on which the skin is stretched is connected to a central screw. The hoop is fixed to a wheel with central nut sliding on this screw. By turning the wheel, you are tensioning or not the whole skin in a perfectly smooth and accurate manner. 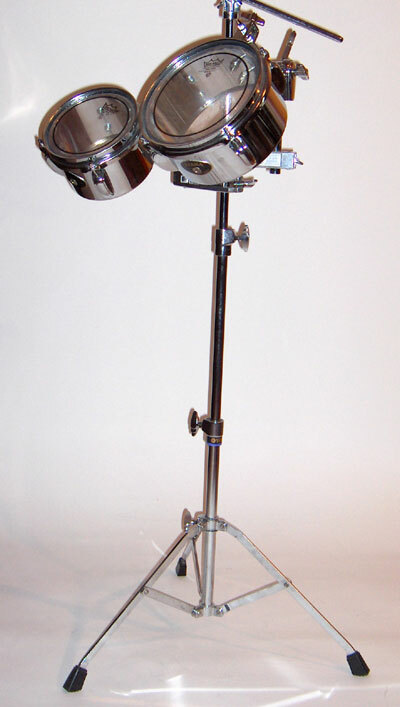 Most rototoms are also attached to the end of the screw on a rail attached to a stand (usually 3 rototoms of 6, 8 and 10 inch of diameter of skin, but they exist in all diameter, in imitation of the toms) which is a supplementary invention. Terry Bozzio used for a time a drumset with rototoms instead of toms (early). Rototoms power is quite weak because of no sounding box (shell). However, the use of microphones allows a harmonized use with the cymbals (too powerful if there are not). 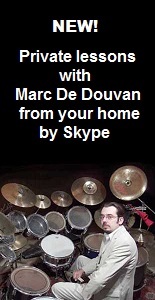 The advantage of the tonal clarity of the rototoms allows an extended set, a bit like a keyboard (with a scale). Terry Bozzio uses now "piccolo toms" tuned precisely. They do not have a wheel and a shallow shell and at first without resonance skin, like timbales, but in wood (today he came back to double skin and tension). 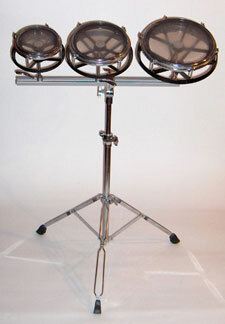 In recent years, some drum brands like japanese Tama sell mini-timbales (6 to 10 inches in diameter (photo cons)) metal (chrome steel), very similar to the "piccolo toms", which are holded with the same type of fasteners as the bells. This is what I currently use. The steel giving a more pure, sharp, slapping and powerful sound, they fit well with normal toms with wooden shell (more "round" and "dull" sound), in larger sizes.